Missing emails are the modern equivalent of Richard Nixon's missing 18½ minutes of Watergate tapes. Keeping track of President Obama’s scandals is like drinking from a Paul Bunyan-size fire hose. There’s the extra-constitutional, even lawless rule by executive fiat on immigration, health insurance, emissions regulation, and much, much more. There’s the $840 billion stimulus boondoggle that delivered exhibitions in cronyism, such as Solyndra and Sen. Angus King’s Record Hill Wind. There’s the “Fast and Furious” gun-walking scheme that resulted in the deaths of Border Patrol Agent Brian Terry and countless Mexican citizens. There are scandalous personnel decisions, chief of which is Attorney General Eric Holder, who, with his near-perjury, contempt of Congress and refusal to pursue justice blindly, is a walking, talking scandal. There’s the deadly corruption of the Veterans Affairs health care system, which gets worse with every Inspector General report. There’s the Orwellian spying on virtually everyone in the world, which isn’t the president’s alone, but which he had the power to change, promised to, but did not. Then there’s the mountain of catastrophic foreign policy blunders. Indeed, no U.S. foreign relation is better off than it was six years ago following the reign of Mr. Obama and dithering Secretaries of State Hillary Clinton and John Kerry. But even in the context of this rather incomplete list of opprobrious failure, one scandal stands above the rest: the Internal Revenue Service’s deliberate harassment of Mr. Obama’s political enemies. For those who haven’t been paying attention, more than a year ago IRS officials copped to targeting nonprofit groups for extra-legal harassment in a staged news conference. Having “patriot” in your name or being “critical of the way the government is run” was enough to elicit an inquisition into the source of a group’s donations, their literary inspiration or even the content of prayers. Like most letters from the tax agency, the effect was chilling. The obvious goal of this harassment was to intimidate these groups to prevent a repeat of the 2010 elections, in which a wellspring of citizen activism spawned a tidal wave of conservative political change. Sadly, it worked: The president secured re-election, thanks, in part, to the ideologically driven tyranny of corrupt tax collectors. Yes, like Mark McGuire’s and Sammy Sosa’s home run records, Mr. Obama’s second term deserves an asterisk in the history books. Mr. Obama was outraged, we were told, when he learned of the IRS’ malfeasance, which he did from reading the news – go figure. After initially resolving to investigate the political corruption of which he was the prime beneficiary, he soon recanted, declaring conservative angst unfounded. 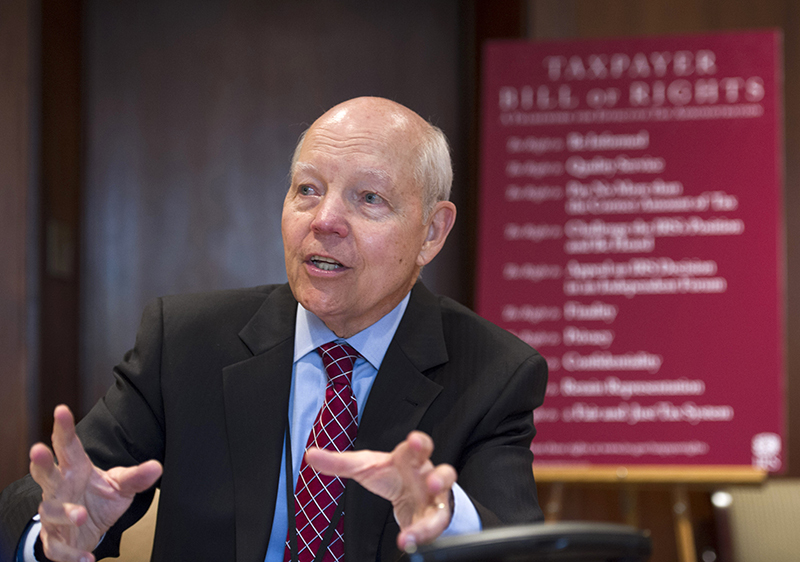 There’s not a “smidgen” of corruption at the IRS, he infamously intoned. Yet from the very beginning, IRS officials have not been forthcoming. They said it was “rogue” low-level officials in Ohio; that was false – the targeting was directed from Washington. They said progressive groups were also targeted – that was false. Now, more than a year after congressional investigators and private attorneys demanded that the IRS turn over evidence related to the harassment of conservatives, the tax agency has come out with a whopper. The IRS claims to have lost two years’ worth of communications from the very IRS employees implicated in the sordid scheme. Namely, the emails of Lois Lerner, the highest-ranking official implicated in the scandal to date, and six other officials also tied to the targeting of Mr. Obama’s political enemies. All too conveniently, the missing emails cover January 2009 to April 2011, the timeframe in which the harassment occurred. More conveniently, the lost records include only communications with outside entities, such as the Department of Justice and the White House. This is the modern equivalent of Richard Nixon’s missing 18½ minutes of Watergate tapes, with one key exception: Email doesn’t just disappear and is nearly impossible to destroy, even if malevolent actors are dedicated to concealing evidence of criminal activity. Tech-savvy source after tech-savvy source has come forward to say that it would be impossible for such a vast amount of data to simply disappear. Yet we’re still left to believe that Lerner & Co. can’t prove they didn’t conspire with the Oval Office. Perhaps we’ll never get answers, but isn’t that answer enough? Only the most incredulous of Obama’s sycophants can view this latest turn of events as anything other than a deliberate obfuscation of severe political wickedness at the highest level of government. And yet, from the left, silence. Liberals are too busy banning coffee cups, taxing grocery bags, hash-tagging and stealing losing football teams’ trademarks to care about the most heinous abuse of government power in modern American history.